Jeremy Knight shares his memories of July in Chawton on this family’s ancestral estate where Jane Austen lived and wrote – and Jane was never more celebrated than in July. "When I was a child July was the start of the long summer holidays and I often had a friend from school to stay in Chawton. We spent our days out and about in the garden and woods. At the start of the summer the large swimming pool on the edge of the lawns would be filled – it took about 3 days and another week to warm up enough for us to use and we would then spend most of our time in and out of the water. The swimming pool was removed in the 1990s when Chawton House was turned into a public building. 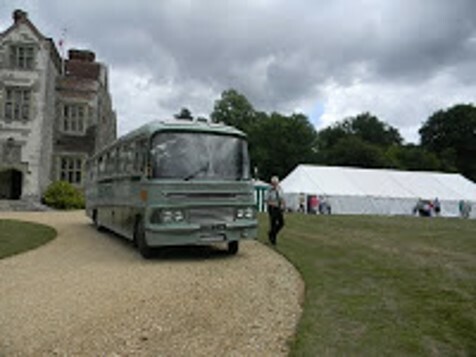 The AGM of the Jane Austen Society of the UK was held in a large marquee on the lawn at Chawton House every July. Over 200 people came for the event and we all chipped in to help with the preparations. We put out cones along the driveway and signs around the house so people knew where they could and couldn’t go. We also set out the chairs in the huge marquee erected on the lawn for the occasion but when the children were old enough they earned pocket money doing this job. For many years my mother, an excellent cook, supplied tea and homemade cakes for all those attending until this came too much for her to manage and caterers were used. One year, at about 4.30pm when the event was almost over, a taxi drew up with an American lady who had flown over for the meeting, but her plane was late arriving at Heathrow. I rustled up some tea and cake for her and the driver and gave her a quick tour of the public areas of the house before she got back in the taxi back to the airport for her return flight home. How amazing to fly from America just for the meeting! But oh, how disappointed she must have been. I don’t know if she ever made it another year. We were always amazed at how far people travelled to come, all ages young and old - in the early days it was hard to believe Jane’s international popularity, it was before the modern boom of Jane Austen fandom across the world. The Jane Austen Society AGM is still held at Chawton House each year, with ever increasing numbers. In my memory, it was always a lovely sunny day and I can picture people enjoying wandering in the gardens. In the mid 1980’s, with a group of brilliant friends we started to use the marquee in the evenings to hold a Ball as a fundraiser for the church. We had to clear the marquee after the meeting had finished and set up tables, chairs, dance floor, lighting and electrics for a band - all in about 2 hours! Thankfully we had many helpers. The Balls were such a success we wondered why we hadn’t thought of it before. Several of our friends stayed for the weekend so the house was full. It was great fun as we always enjoyed entertaining. On the Sunday, it would be all hands on deck to clear the marquee ready for the hire company to collect, which could be any time in the next couple of days. One year they caught us out by turning up on Sunday morning before we were ready - which caused a bit of chaos as we hastily removed everything out of their way! When it was all over we could relax for a week or two before preparations started for the fete and horticultural show in August.